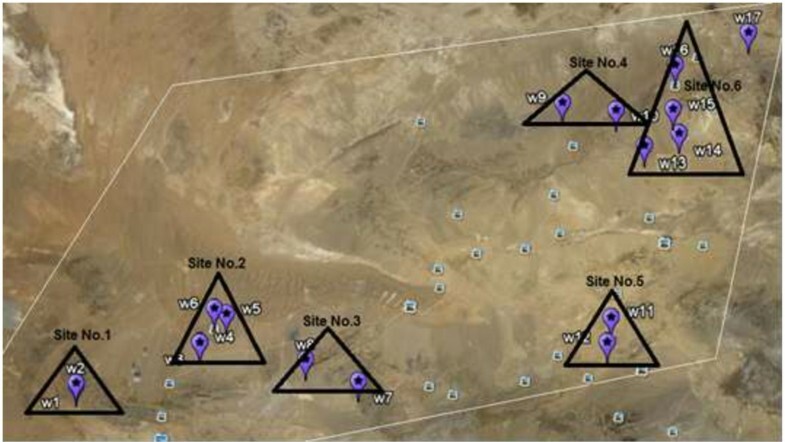 The radiological quality of 226Ra, 232Th and 40K in some samples of water resources collected in Anarak-Khour a desertic area, Iran has been measured by direct gamma ray spectroscopy using high purity germanium detector in this paper. The concentration ranged from ≤0.5 to 9701 mBq/L for 226Ra; ≤0.2 to 28215 mBq/L for 232Th and < MDA to 10332 mBq/L for 40K. The radium equivalent activity was well below the defined limit of 370Bq/L. The calculated external hazard indices were found to be less than 1 which shows a low dose. These results can be contributed to the database of this area because it may be used as disposal sites of nuclear waste in future. The presence of naturally occurring radionuclides as well as some elements provides important information about the quality of water resources especially drinking water . Naturally occurring radioactive materials (NORM) consist of uranium, thorium, potassium and any of their decay products such as radium and radon. Concentrations of these natural radioactive elements are very low in the earth’s crust and atmosphere. These elements can be brought to the surface by human activities. Although the radioactive elements in the earth’s crust are the reasons of presence of radioactivity in water resources, high concentration of radioactive materials in water resources might be accidentally or intentionally [2, 3]. The public can be affected by the environment where is adjacent to the released point of the radioactive materials . If radioactive materials are released into the environment, radionuclides may be moved into the body by inhalation and ingestion, which causes internal exposure. Fakeha et al. analyzed samples from well water and bottled drinking water from the Western Province of Arabia for concentrations of natural radioactivity and their contribution to the absorbed dose from water samples using gamma spectroscopy method . Fasunwon et al. studied the activity concentrations of natural radionuclide levels in well waters of Ago Iwoye, Nigeria by HPGe (high purity germanium) spectrometer . They estimated that radiological health burden on the human populace is very minimal and has neither health implications nor affect the background ionization radiation. In a research article studied that natural radioactivity of different brands of commonly sold bottled drinking water in the federal capital Islamabad and Rawalpindi city of Pakistan and found mean concentrations of 226Ra, 232Th and 40K were 11.3 ± 2.3, 5.2 ± 0.4 and 140.9 ± 30.6 mBq/L, respectively using gamma spectroscopy technique . The United Nations Scientific Committee on the Effects of Atomic Radiation (UNSCEAR) estimated that exposure to natural radionuclides contributes around 70% of the population radiation dose. The global average human exposure to natural sources is 2.4mSv/y and the weight of water and food is about 0.3mSv/y. The objective of this study is to obtain a representative estimate of the concentration levels of natural radionuclides in water resources which might be used as drinking water in some our studied sites from the central deserts of Iran, also estimate the corresponding radiation doses for people consuming this water. With water analysis, soil analyses have been performed in this area. The obtained results can be contributed to the baseline data of radionuclide concentrations in this area. 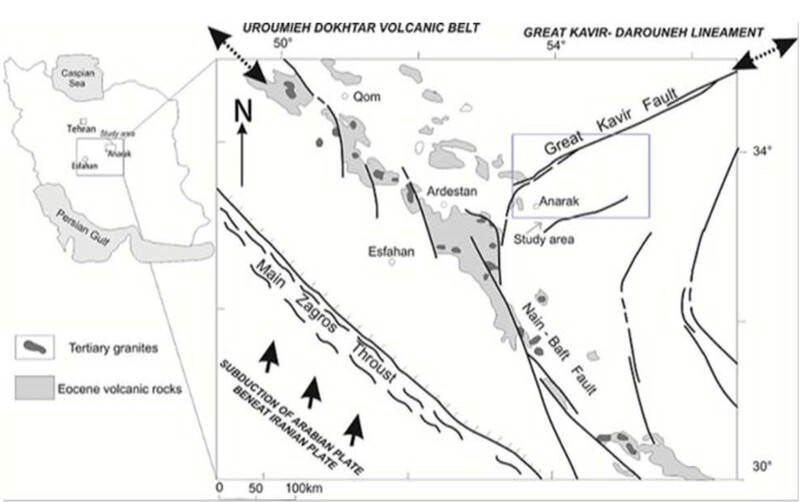 The intersection of Uroomieh-Dokhtar Magmatic Belt (UDMB) and the major Great Kavir- Doruneh fault (GKDF) are two dominant structural features in the Anarak-Khour area and the change of direction of Great Kavir-Doruneh fault towards the Nain-Baft fault (Figure 1). This region occupies the north-western corner of the Central-Eastern Iranian microplate. This terrane is an approximately 2300km2 region of moderate relief surrounded by folding and thrust belts within the Alpine-Himalayan orogenic system of western Asia. This terrene is an area of continuous continental deformation in response to ongoing convergence between the Arabian (Gondwana) and Turan (Eurasian) plates . Continental volcanism along the UDMB and in Central Iran, which also comprises the volcanic rocks of the Anarak-Khour area, is attributed to that subduction. Main structural lineaments in Central Iran and location of the study area (modified from). In the Anarak-Khour area there are a few compositionally complex hydrothermal Cu-Ni-Co deposits which always interested for researchers. Apart from Cu, Ni and Co the ores contain As and U and occasionally Pb, Zn, Au and Ag. All these deposits are localized in the same area under similar geological environment along the north-western and western surroundings of Anarak-Khour massif (Figure 1). These deposits contain a distinctive set of elements and minerals. In the Anarak area, Co, Ni and As are abundant but there is little Ag or Bi . The deposits also show some U. Cu is different because its concentration is high and in particular the abundance of copper arsenides. As with other deposits, Fe is present in only small amounts and S is rare in the arsenide stage of mineralization. Talmessi and Meskani mines are ancient mines for Cu, Ni and Co products that mining activities have ceased since 1960. Recently, exploration activities were conducted by the atomic energy organization of Iran in the course of uranium exploration but there is not any U mine in this area until now. The most important active mine in the area is Nakhlak lead deposit, 40 Km east of Anarak. In geology and geochemistry, the radioactive deposits are associated with high concentrations of heavy metals such as As, Cd, Co, Cr, Cu, Fe, Hg, Ni, Pb, S, Sb and Zn. It seems the presence of deposits and location of this area along the fault is caused these materials coming from the deeper layers to the surface layers and this can be a reason for founding the radionuclides and assessing the radiological risk in this area. Anarak-khour is a landscape that is very dry because of low rainfall amounts (precipitation) then finding water in this area is difficult. Water sampling was taken from well water, reservoir and ground water. The sample locations were recorded in terms of degree-minute-second latitudinal and longitudinal position using a hand-held Global Positioning System (GPS) unit in Table 1. Places that would likely have a greater radioactivity concentration were selected as sample sites. Then the water samples of this area are collected from 33°22’46.52” N (with 53°27’47.90” E) to 34°12’25.12” N (with 55°18’55.40” E). The studied area is located within the rectangular area and is divided into six sites as shown in Figure 2. Reference methods for collecting procedure and handling of the water samples were taken from the International Atomic Energy Agency (IAEA, water sampling and laboratory treatment). Some these samples came from wells with submerged pumps. The water samples were gathered in two liter plastic bottles and were acidified with nitric acid to pH < 2. Physicochemical parameters of water such as temperature and pH were also measured in order to find the impact of these parameters on the concentration of the radionuclides in water. For water samples 800 mL of each sample was transferred to a Marinelli beaker. Then, the Marinelli-beaker was sealed and kept for at least 5 weeks. During this time, the daughter of radon achieves to equilibrium with 226Ra. Then the samples were ready to analysis by gamma spectroscopy . Where the constant values a, b, c, d, e, f and g are -0.0004 ± 0.0001, -0.02 ± 0.004, -0.01 ± 0.0006, 0.0001 ± 0.00004, 0.0003 ± 0.00005, 0.000000008 ± 0.000000001 and -0.00000006 ± 0.000000001, respectively. A wide range of different gamma-ray energy transition lines ranging from about 100 keV up to 1765 keV, associated with the decay products of the 226Ra, 232Th and 40K. The known photopeak lines with background subtraction were used to determine 226Ra, 232Th and 40K. The counting time of sample spectra was also 24 hours. The activities were measured using following relationship. where N, t, m, p and ϵ (E) are net area counts, time, intensity, weight of sample and absolute photopeak efficiency at specific energy, respectively . The specific activity of 226Ra was evaluated from gamma-ray lines of 214Bi at 609.3, 1120.3 and 1764.5keV and 214Pb at 295 and 351keV, while the specific activity of 232Th was evaluated from gamma-ray lines of 228Ac at 338.4, 911.1 and 968.9keV. The specific activity of 40K and 137Cs was determined from its 1460.8 and 661.6keV gamma-ray lines . The minimum detectable activity for each radionuclide was 0.54 mBq/L for 226Ra, 0.21 mBq/L for 232Th and 0.01 mBq/L for 40K. The concentrations of radionuclides of 241Am, 137Cs and 152Eu measured in standard reference material (POLATOM) and results are presented in Table 2. 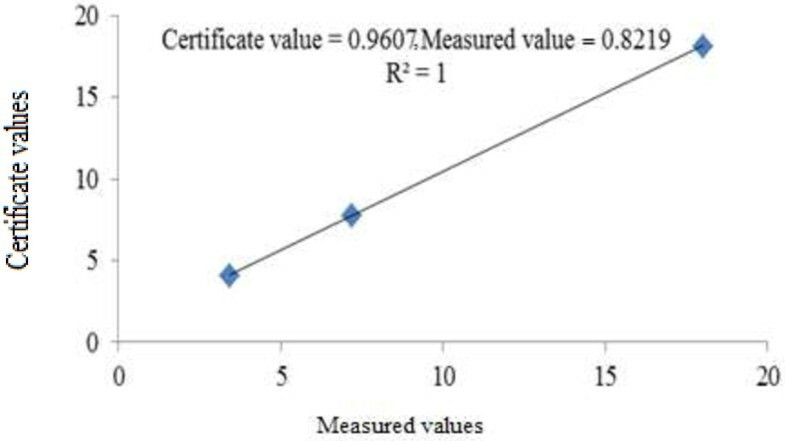 The measured concentrations of 241Am, 137Cs and 152Eu had high consistent with the certificate ones, the correlation coefficient for the liner regression between the measured and reference concentrations was 1 as shown in Figure 3. 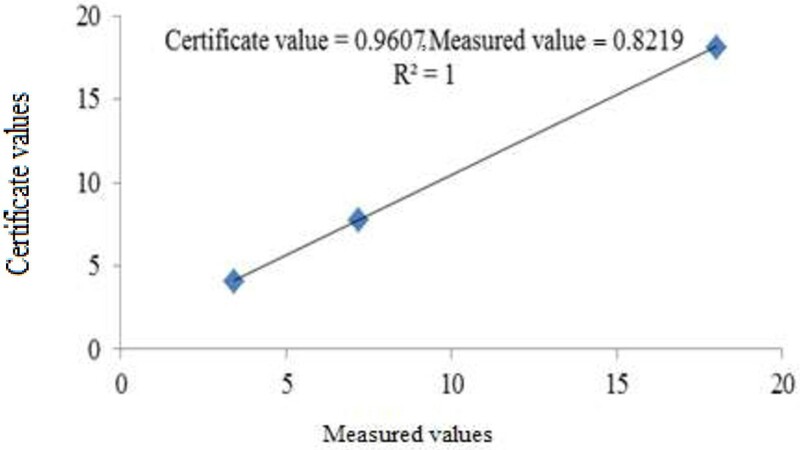 Correlation coefficient for the liner regression between the measured and reference concentrations. Radioactivity levels of 226Ra, 232Th and 40K in the water samples collected from different parts of the studied area are presented in Table 3. As shown in Table 3, activity concentrations in the water samples are in the range of 120 ± 30 - 2836 ± 274 mBq/L for 226Ra; 257 ± 39 - 7465 ± 607 mBq/L for 232Th and 2930 ± 490 - 7168 ± 1067 mBq/L for 40K. The maximum activity concentration of 226Ra and 232Th is found on site No.6 (Irakan Zone) which may be related to the geological structure of the region. The maximum activity concentration of 40K is found in site No. 1 (Talmessi mine). Potassium activity varied widely with CV (Coefficient Variation) =38% due to heterogeneous soil characteristics of this area . The activity concentrations of 226Ra and 232Th in our samples are compared with the UNSCEAR reference mean values which are 1 mBq/L and 0.05 mBq/L in United States, respectively . The activity concentrations of 226Ra and 232Th in the studied area are much more than the UNSCEAR reference values in the United States. Comparison of radioactivity of waters with other desertic areas has been done. The concentration of radioactivity of 226Ra in Arabia, Nigeria and Pakistan was reported between < MDA – 2500 mBq/L (with an average 1810 mBq/L), <MDA – 5400 mBq/L (with an average 1200 mBq/L) and 11300 mBq/L, respectively [1, 5, 6]. The mean concentration of 226Ra in Anarak-Khour is lower than the average concentration of it in Arabia, Nigeria and Pakistan and also is lower than its minimum concentration in Egypt. The concentration of radioactivity of 232Th was reported between < MDA and 3300 mBq/L (with an average 1470 mBq/L) in Arbia, < MDA and 6200 mBq/L (with an average 1600 mBq/L) in Nigeria and 5200 mBq/L in Pakistan. The mean concentration of radioactivity of 232Th in Arabia, Nigeria and our studied area is almost identical. The range of concentration of radioactivity of 40K was reported between < MDA and 339200 mBq/L (with an average 17596 mBq/L) in Arabia, < MDA and 50900 mBq/L (with an average 25100 mBq/L) in Nigeria. In Pakistan, the mean concentration of 40K about 140900 mBq/L was reported. Moreover, the results are compared to the World Health Organization proposed the following guidance levels for the activity concentration in drinking water (10000 mBq/L for 226Ra and 1000 mBq/L 232Th) . The measured activities of 226Ra in the samples did not exceed the guidance level recommended by WHO (World Health Organization). For 232Th, Site No.6 had higher activity concentrations (7465 mBq/L >1000 mBq/L) compared to guidance levels recommended by WHO for drinking water. Figure 4 shows the distribution of 226Ra, 232Th and 40K activity concentrations of water samples. As shown in Figure 4, activity concentrations of 232Th were higher in water samples than 226Ra. In the waters in general, the concentration of 232Th was found to be higher than that of the 226Ra because 226Ra may be created on the surface of the host rock or ejected into the aqueous phase via alpha recoil. Both processes would affect in a depletion of 226Ra relative to 232Th. Additionally, 226Ra is more soluble and mobile in ground water than 232Th and may leach from the host rock, independent of the place of creation. There is a relationship between the activity concentration of 226Ra and 232Th with R square value 0.99 from our sampling site. This shows in all sampling sites the ratio of 232Th to 226Ra is more than one. Distribution of activity concentrations of 226 Ra, 232 Th and 40 K in water samples. where ARa, ATh and AK are the activity concentrations of 226Ra, 232Th and 40K, respectively. The calculated total gamma dose rate due to primordial radionuclides varied from 0.29 to 6.102 nGy/h. The average total gamma dose rate was less than the worldwide average of 55 nGy/h . The annual effective dose obtained in the investigated areas ranged from 0.36 to 7.502μSv for the background area. The reported gamma dose rate and annual effective dose in other places, such as Lake Bosumtwi Basin in Ghana  is higher than these areas. But, Abo Zaabal in Egypt , Niger Delta (Biseni) flood plain lakes , Outer Carpathians in Poland  is lower or at least equal to the values of this research. If the value of internal or external radiation hazard index is found to be less than unity, then there is no potential internal or external radiation hazard. The external radiation hazard index (Hex) in water varied from 0.002 to 0.0376 whereas the internal radiation hazard index (Hin) in water varied from 0.002 to 0.0448. This indicated that the water of Anarak-khour area were free from the radiation hazards. The absorbed dose rates (D), annual effective outdoor dose rate, radium equivalent activity (Raeq) Hex and Hin of our samples are calculated and their results are shown in the Table 4. As seen in this table, Hex and Hin of our results are less than unity which shows there is no radiation hazard for the body. Our estimate of water radioactivity concentration on Anarak-khour area in central of Iran is done using gamma-ray spectrometry. The maximum activity concentration of 226Ra and 232Th is found in Irakan Zone. The maximum activity concentration of 40K is found in Talmessi mine. The measured activities of 226Ra in the samples did not exceed the guidance level recommended by WHO but the measured activities of 232Th in Irakan Zone exceeded. The calculated total gamma dose rate varied from 0.29 to 6.102 nGy/h. The annual effective dose obtained from 0.36 to 7.502μSv for the background area. The internal radiation hazard index (Hin) in water varied from 0.002 to 0.0448. The parameters of absorbed dose rate, annual effective dose, radium equivalent activity, external radiation hazard index and internal radiation hazard index is calculated and their results showed there is no potential internal radiation hazard. This study can be followed by analyzing the deep soil and plants of the studied area. Moreover, because there are a lot of people who physically are impaired, the birth rate of children with defects should be compared with the radiounuclide concentrations in soils, waters and plants in every few years. Our results will contribute to the data base of this area in future. Then it is necessary that after operating the disposal site of nuclear waste all environment samples of the studied area should be performed every year and compared with our results. Elham Ehsanpour, Mojtaba Mostajaboddavati and Hashem Bagheri contributed equally to this work. The authors wish to thank the office of graduate studies of the University of Isfahan for its support. They would also like to thank the staff of central laboratory of University of Isfahan for their assistance. Also, the authors wish to thank Dr. Rezaee for her help and her valuable guidance. EE carried out the sampling, participated in the experimental analysis in laboratory. MRA participated in the analysis of the data and drafted the manuscript. MM conceived of the study, and participated in sampling. HB participated in geology part. All authors read and approved the final manuscript.